The last couple of days have been pretty quiet, which doesn't make for exciting Blogmas material. So during this lull (aka normal life) I started thinking about Christmas music. I have all the Christmas CDs in the car right now and I find I keep playing the same ones over and over again. So here's my top 5 favourite - what do you think? Are there any here you love or hate? I remember being in New Look in Oxford Street once when this was playing. The two young girls next to me were so horrified - they thought it was so rude! I think it's kind of beautiful and very sad. I like this Mariah Carey song - and I'm proud of it. This anti-war song seems even more relevant this Christmas. Finally, this is a such a classic and is Christmas all wrapped up for me in one song. I could have done way more than 5 - maybe I'll add some more later in the month. 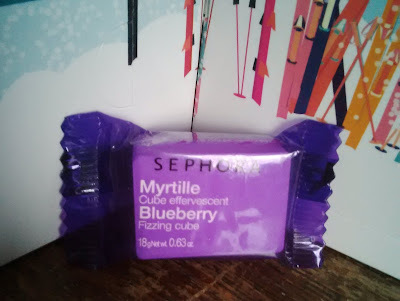 Sephora Advent Calendar 6 was a cute mini bath bomb - very good! Day 7 was place cards (I think...) photo to follow for that.